If it is fall (and by all weather indications here in the Copper Country it is--down to 34 F tonight) it is time for the North American Labor History Conference at Wayne State University. I (Gary) presented at the conference last year on extra-legal direct action and met a bunch of great folks--academics and activists alike--it was a great experience. Also stayed in a wonderful union hotel in downtown Detroit. Again, this year the Copper Country is represented at the conference by historian Dr. Larry Lankton of Michigan Technological University's Social Sciences department. Larry, who has been doing Copper Country history for over two decades, is providing comments on a documentary related to a Woody Guthrie song about the Italian Hall tragedy, 1913 Massacre by Ken Ross and Louis V. Galdieri. The documentary is being shown Thursday, October 18, at 6 pm. The film and Larry's commentary are being sponsored by "The Workers Compensation Section of the Michigan Bar and Wayne State University Law School, in celebration of 100 years workers' compensation in Michigan." The documentary looks at public memory of the Italian Hall and 1913-14 Strike in Calumet using Woody Guthrie's lesser-known, but powerful ballad, "1913 Massacre." Guthrie penned and then sang the song after reading Ella Reeve "Mother" Bloor's account of the Italian Hall tragedy in her autobiography We Are Many, which was published in 1940. Guthrie then hit the airwaves, concert halls, and outdoor venues with the song to bolster unionization efforts during the Franklin D. Roosevelt administration, which was overall, and in a general sense, sympathetic to organized labor. 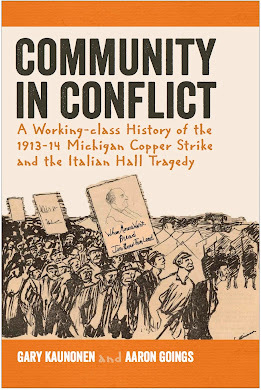 Ken and Louis and 1913 Massacre will also be appearing at the Calumet Theater this fall, October 5 and 6 for a showing of their film, and will be in the Copper Country fall of 2013 for the Writing Across the Peninsula Conference sponsored by Michigan Tech's Humanities Department.